Major General Michael A. Calhoun is assigned as The Adjutant General, Florida. As the Adjutant General, he is the senior military advisor to the Governor, responsible for the overall management, readiness, and mobilization of both U.S. Army and U.S. Air Force elements of the Florida National Guard. He previously served as the Assistant Adjutant General-Army Element, with the additional duties of the Director of the Joint Staff (DJS), Joint Task Force Commander and Dual Status Commander, designee. 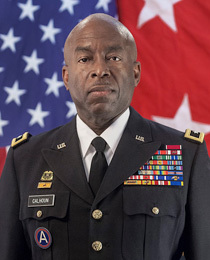 Following graduation from Florida A&M University, General Calhoun enlisted as a private into the Florida National Guard in August of 1977 and served for six years. After a six year break in service, he received a direct commission and appointment to 1st Lieutenant in the Medical Service Corps on 22 July, 1989. His follow-on assignments include Chief of Pharmacy Services, 131 MASH; Executive Officer, 131st MASH; Logistics Officer, 50th Area Support Group (ASG); Director, Host Nations Support, 50th ASG and Director, Support Operations 50th ASG. General Calhoun deployed with the 50th ASG in 2003 as Director of Host Nations support during Operation Iraqi Freedom and served as Deputy Commander, Task Force (FL), in Mississippi, during Hurricane Katrina. General Calhoun commands include, Company A, 161st Area Support Medical Battalion; the 856th Quartermaster Battalion (Water); the 53rd Infantry Brigade’s Special Troops Battalion; the 211th Regiment, Regional Training Institute (RTI-FL); the 50th Area Support Group and the 83rd Troop Command.